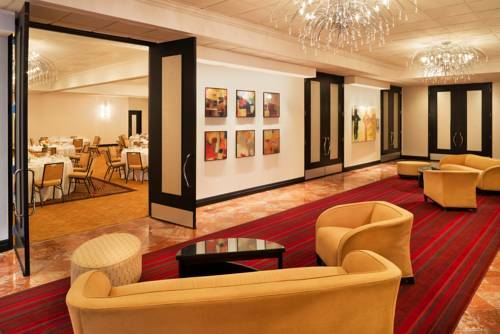 Find your home away from home at Sheraton Bloomington Hotel. Our newly-renovated hotel offers thoughtful amenities, 4-star service and a superior destination for business and leisure travel. Explore Minneapolis and Bloomington from our convenient location near the Mall of America, Edina and Richfield. After a big day in the area, find relaxation in our spacious, pet-friendly rooms with ultra-comfortable Sheraton Signature Beds, flat-screen TVs, modern work spaces and complimentary high-speed internet access. Enjoy world-class dining at our highly-rated, contemporary American restaurant, Lela. In the morning, stay fit in our 24/7 Sheraton Fitness Center, or take a brisk jog in the surrounding areas. For those planning a business gathering or sophisticated social affair, we offer elegant, flexible event spaces to meet your every need. Sheraton Bloomington Hotel offers world-class service and well-appointed hotel accommodations to make your stay unforgettable. Lela: Savor traditional classics with an innovative flair at Lela, our award-winning American restaurant with an inviting urban atmosphere. Enjoy succulent seafood crudos, juicy prime steaks, hand-made pastas and shareable plates rooted in classic techniques. The Sidebar: Start your day in Bloomington with a Starbucks coffee and grab-and-go breakfast items at The Sidebar, or come back early evening to enjoy our hotel bar offering appetizing American cuisine, extraordinary cocktails, craft beer and fine wines.